The Stage/YMTUK Scholarship 2018: Are you the next Ed Sheeran? Youth Music Theatre UK, a new partner to The Stage Scholarships, is offering free tuition to one lucky winner, says Lisa Martland. Could it be the shape of you? The first partner in The Stage Scholarships scheme to be featured this year is a new addition offering one talented young person aged between 11 and 21 an opportunity to follow in the footsteps of Ed Sheeran, Sam Smith, Charlotte Ritchie and Lauren Samuels. These notable names are just a few of the famous artists who have trained with national performing arts company Youth Music Theatre UK. YMT specialises in creating new music theatre and works across the UK and Ireland to provide high-quality training for talented young performers and musicians while supporting emerging directors, writers, composers, choreographers and stage technicians. Over 15 years, YMT has taught more than 8,000 students and created over 80 new shows, including Loserville, which was nominated for an Olivier for best new musical in 2013. The scholarship winner receives funding for a place on YMT’s Musical Theatre in Production course (worth £1,900) and will be allocated on to a production in summer 2018. For the first year of the scholarship in association with The Stage, the company is concentrating on performers only (actors and musicians), but the remit may be extended to technicians in 2019. YMT executive producer Jon Bromwich says: “The winner could find themselves in London, Belfast, Plymouth, Leeds – wherever we are presenting the shows. But as it’s a residential course it doesn’t make any difference where they go – all the costs of accommodation, food and lodging are covered. In London we are performing at Richmond Theatre and at the National Army Museum; in Belfast, at the Lyric Theatre. Summer projects for this year include Howard Goodall’s musical re-imagining of A Winter’s Tale; Help! Get Me Out of This Musical! – a pop-rock musical directed by Luke Sheppard (In the Heights); Barrack Room Ballads, inspired by Kipling’s First World War elegies, with music by renowned composer Conor Mitchell; and Paperboy, a coming-of-age musical drama set against the backdrop of 1970s Belfast. 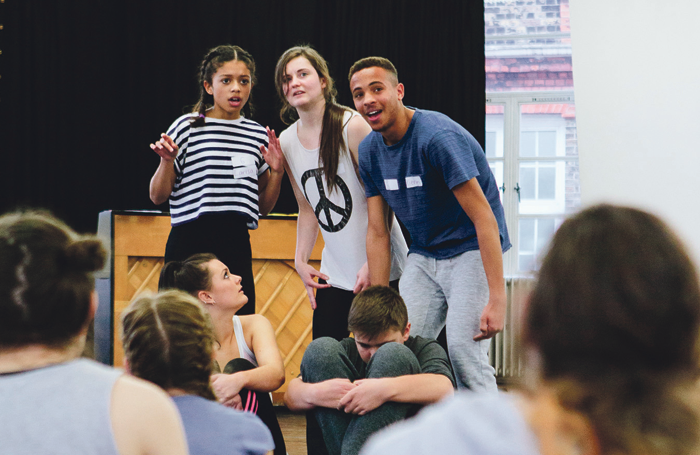 YMT often provides a bridge between local drama groups and formal training at drama school, but Bromwich explains that the young people who audition have a huge range of experience. Some have none and still get through; others have years of dance or singing training. “We are looking for people who are switched on, ready to open their minds to new ideas, but they may have variable skill sets. They need to remember that ensemble playing is absolutely vital in music theatre and complex dance shows. We also love young actors who play an instrument and musicians who are prepared to act/sing. Audition dates: January 14 to February 18 in 28 cities across the UK. A single 100% bursary place will go to the highest scoring (at auditions) young person who is both new to the company – ie, has not got in before – and who is eligible for a bursary on financial grounds (from a family with household income below the set limit of £30,000). Applicants can be aged from 11 to 21 years old.